Bill Posters has unveiled his latest body of new works entitled ‘YOU WILL: A Detour Into Dataism’ at the Artmossphere III Street Art Biennale held at the Winzavod Centre for Contemporart Art in Moscow, Russia. 25 years ago, AT&T’s prescient 1993 ad campaign entitled ‘YOU WILL’ launched the field of computational propaganda in cyberspace via the world’s first ‘pay per click’ advertising banner. 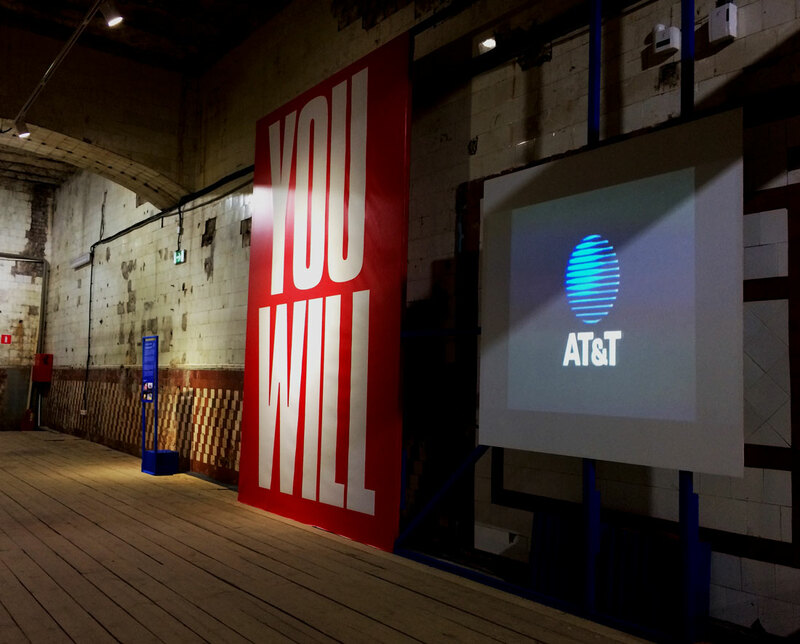 To mark the 25th Anniversary, Bill Posters‘ launched YOU WILL: A Detour Into Dataism at the Artmossphere III Street Art Biennial held at Winzavod Contemporary Art Centre in Moscow, Russia. 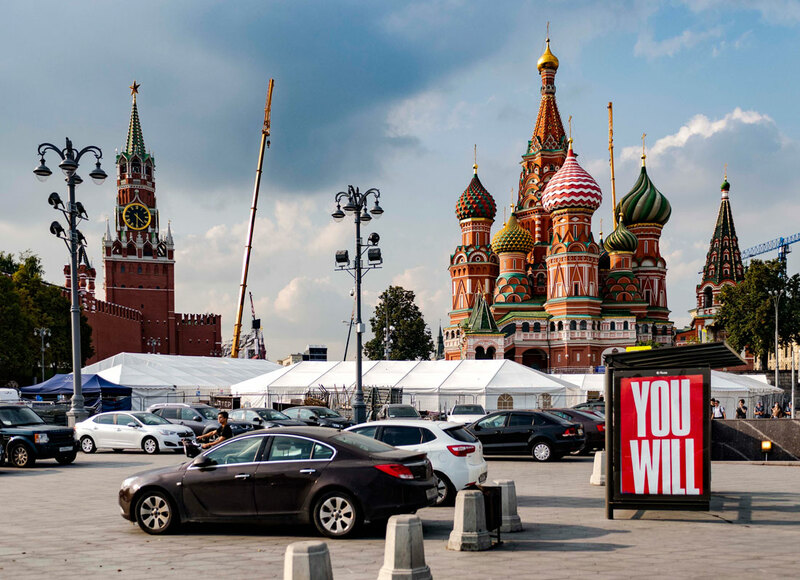 A quarter of a century after the original advertising campaign first appeared online; and in the context of multiple investigations into Russian state interference in western democratic processes; a site specific intervention outside the Kremlin in Moscow completed a new tryptych of works to mark the start of this long term project. In the city where you live, perhaps in the same office block where you may work, someone, somewhere is constantly trying to categorise you in ways that may not be true. Machines are learning how to constantly infer judgements about you; what you believe is important; and what you will do next as a result. YOU WILL infers the effects of the latest developments in machine learning and behavioural sequencing by algorithms and AI originally developed for ‘pay per click’ advertising. YOU WILL interrogates how the development of computational propaganda technologies recently deployed during western elections & referendums in order to influence citizen’s decision making during key political moments offers new terrain for artistic exploration. ‘YOU WILL’ banner ad (1993), original pixel dimensions: 124mm x 16mm. “Propagandist architectures are built to influence public perception – and decision making, via the mediation of information and affective forms of visual stimulus. As new forms of psychometric targeting developed originally by the UK’s military industrial complex are revealed by investigative journalists, the corporate business models developed by advertising corporations, social media platforms and political consultancies like Cambridge Analytica have unveiled new terrains where the battle for ‘hearts and minds’ has now entered domestic consumer markets. Despite the recent outrage, only a small amount of people have left behind their cherished social media platforms, internet search providers and email providers. When personal information and deep analysis conducted using machine learning is applied to each of us to predict and influence our behaviours the cumulative affects of digital and computational forms of propaganda need to be interrogated, critiqued and challenged. The fact that citizen’s data – ranging from political leanings; our locations at every moment of every day; to our sexuality and our psychological traits – is then made available to the highest bidder, digital propaganda and its architectures pose a risk not only to individual rights, but to democracies at large. This new body of works features an installation in the gallery comprised of one single channel video and print. A further site-specific intervention installed adjacent to the Kremlin in Moscow’s Red Square completed the series.